Is Chinese Acupuncture Effective In Chronic Pain? Acupuncture is simply the insertion of sterilised, hair-thin, dry needles in specially designated points on the body to stimulate its own healing abilities. The Chinese used acupuncture for 5000 years, and it has been the subject of continuous study and clinical research since that time. Traditional acupuncture, therefore, is a complex system of examination, diagnosis, and treatment. It seeks to alleviate symptoms and pain by assisting individuals to find balance in their lives. Clinical acupuncture proves to be valuable in medical practice as an effective therapy for acute and chronic illnesses where modern Western Medicine is not indicated or effective. According to Traditional Chinese Medicine, the body has a flow of energy running through the 14 meridians known as Qi (Chee). The Qi flows through the body via a system of channels known as meridians. There are twelve main meridians, six of which are Yin and other six are Yang (equal and opposite forces). When the Yin and Yang become unbalanced a blockage may occur in a meridian. This will disrupt the flow of Qi, which may then cause pain, disease or weakness. Needles are inserted into the meridian to restore the flow of Qi. They discovered that when these organ meridians were out of harmony with one another, or blocked, there is pain, disease, and discomfort in body and mind, and when they were balanced, there is health and peace of mind. The aim of acupuncture treatment is not just to cure health problems or relieve pain, but also to prevent illness by ensuring the Qi flows without disruption. 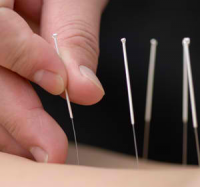 Modern medical research attributes efficacy of acupuncture in relieving pain to its power to increase the body’s level of endorphin (good feeling hormone) in the bloodstream. Furthermore, nerve impulses are normalized and balanced because of the interconnection of the acupuncture points and the central nervous systems, thus suppressing pain. Recent scientific medical research is only beginning to unravel the biochemical pathways which acupuncture employs. The World Health Organisation of the United Nations currently lists 47 different illnesses that may be effectively treated with acupuncture. Some treatable conditions include: migraines, asthma, bursitis, tendonitis, menstrual pain, weight loss, trigeminal neuralgia, stroke rehabilitation, back pain/sciatica, stress-related illnesses, duodenal ulcers, arthritic pain and sports injuries. Acupuncture reduces physical symptoms of withdrawal, relieves depression, anxiety, and insomnia, profoundly relieves withdrawal symptoms including cravings, body aches, headache, nausea, sweating, muscle cramping, etc. Acupuncture can manage any disease or disorder as long as the body is functioning and no organ has been damaged. Therefore, acupuncture’s ability to alleviate the symptoms common to organic disorders is usually strengthening the body’s natural resistance and its immune systems. However, there is no doubt that some patients report significant benefit for most pain problems. ©Copyright 2013 by http://www.naturaltherapyforall.com Acupuncture Newcastle-under-Lyme All Rights Reserved. Prev: What Makes Me an Integrative Therapist?